This morning there was a moderate sized earthquake below the megathrust in Chile. Here is the USGS website for this M 6.4 earthquake. Based upon the hypocentral depth, this appears to be along the megathrust fault (an “interface” event). However, the moment tensor shows extension (so this earthquake may be in the downgoing slab). Given the depth of this earthquake (deeper than the seismogenic zone, the region of the fault that can experience earthquakes, for most subduction zones), this is probably in the downgoing Nazca plate. This is a very seismically active region of the world, with a number of Great (M ≥ 8.0) earthquakes in recent years. Below is my interpretive poster. I have plotted the epicenters (using the USGS earthquake feed kml) for the past 30 days with magnitudes 2.5 or greater, with color representing depth. I also include the slab depth contours from Hayes et al. (2012). These are the depth contours for the fault interface of the subduction zone. Today’s hypocentral depth is 90.8 km and the Hayes et al. (2012) slab contour in this region is between 80 and 100 km. I include the USGS moment tensor for this earthquake. 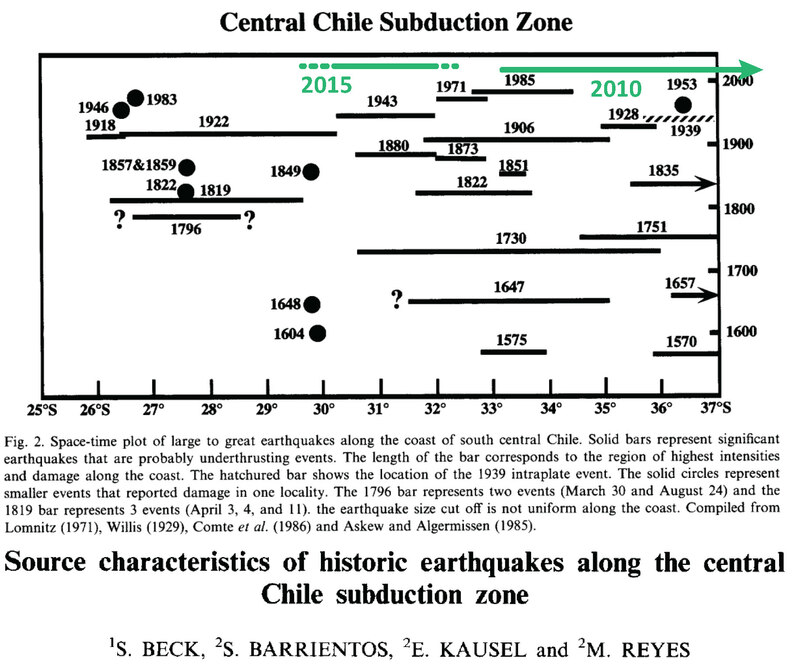 I also plot the rupture length regions of historic earthquakes for this subduction zone in green (Beck et al., 1998 ). I present the patches for the 2010 and 2015 subduction zone earthquakes outlined in white dashed lines. Today’s earthquake happened in the region of the subduction zone that is “down-sip” from the 2010 earthquake. The 2010 earthquake would probably have loaded the fault in this region, so this M 6.4 earthquake may be related to the 2010 earthquake. However, it has been over 5 years since the 2010 earthquake. That being said, there are still aftershocks from the 2011 Tohoku-Oki earthquake (so it seems possible). In the upper left corner I place a cross section from Melnick et al. (2006). This shows the prehistoric earthquake history on the left and a cross section of the subduction zone on the right. This cross section is in the region of the 2010 subduction zone earthquake. In the lower right corner, I include a time-space diagram from Moernaut et al. (2010). This diagram extends further south than the Beck et al. (1998) figure. In the lower left corner I include an inset map from the USGS Seismicity History poster for this region (Rhea et al., 2010). There are two seismicity cross sections here as well, with their locations plotted on the map. The USGS plot these hypocenters along these two cross sections and I include those. 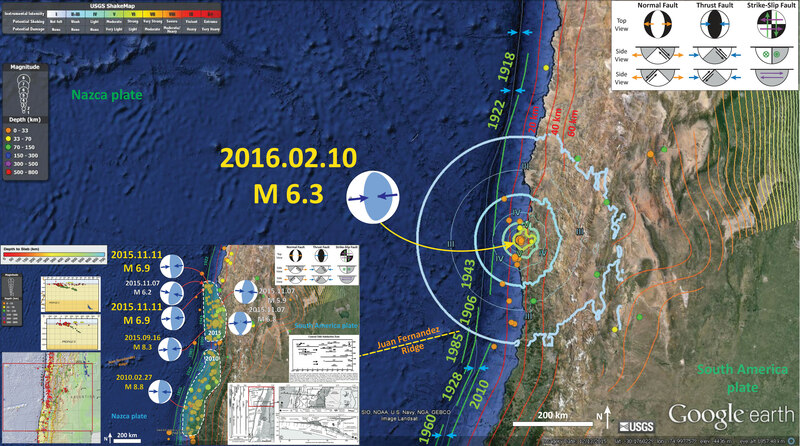 In February of this year, there was a M 6.3 earthquake near the coast which caused considerable damage. Below is my interpretive poster for that earthquake and here is my report. In March 2015, there was some seismicity in this September/November 2015 earthquake slip region. I put together an earthquake report about those earthquake of magnitudes M = 5.0-5.3. I speculate that the 1922 earthquake region is a seismic gap. Note that this September/November 2015 earthquake region is along the southern portion of the seismic gap that I labeled on the map below. Dutchsinse can kiss my 4$$. Hundreds of people died as a result of the 1922 earthquake. The USGS has more news reports about the 1922 earthquake here. There were also reports of a tsunami over 9 meters. So we know that this segment of the fault can produce large earthquakes and tsunami. However, it has been about a century since the last Great subduction zone earthquake in this region of the fault. 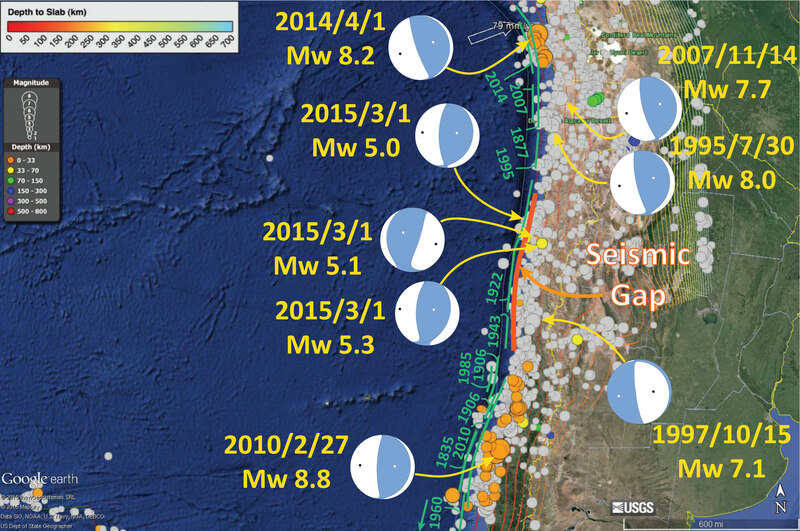 There was significant subduction zone seismicity to the north of this region in 2014. I put together some material for the 2014 earthquake in the past. 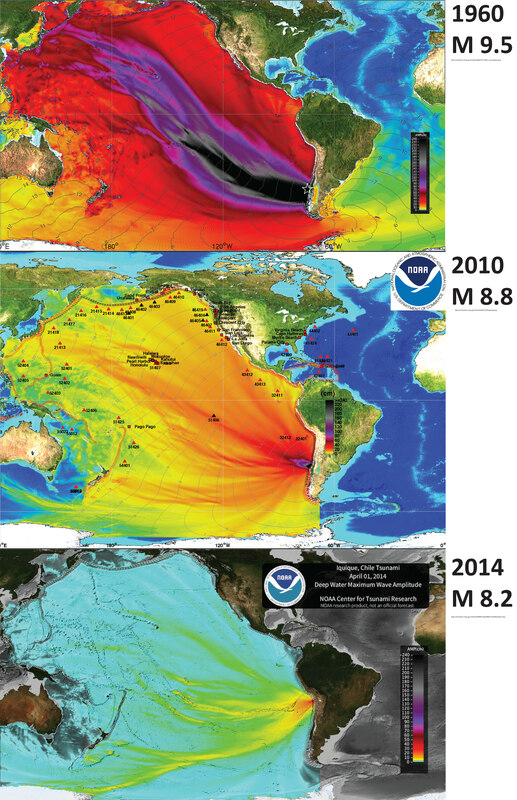 The page where I summarize some of my reports on the 2014 earthquake are found here. 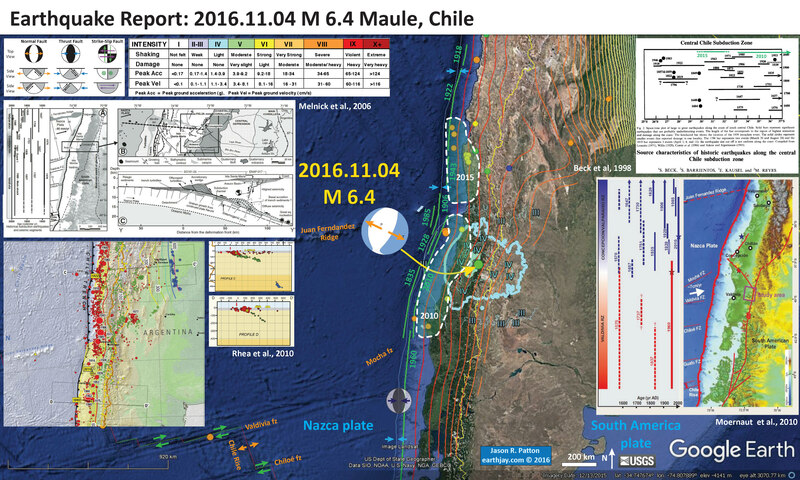 Interseismic Fault Coupling: the 2014 March Northern Chile Swarm 3/27/14: There were some earthquakes in this region of the subduction zone, so I started posting information about historic earthquakes there. M 8.2 earthquake in northern Chile 4/1/14: Here is the main page. There are a couple excellent animations from IRIS on this page!!! 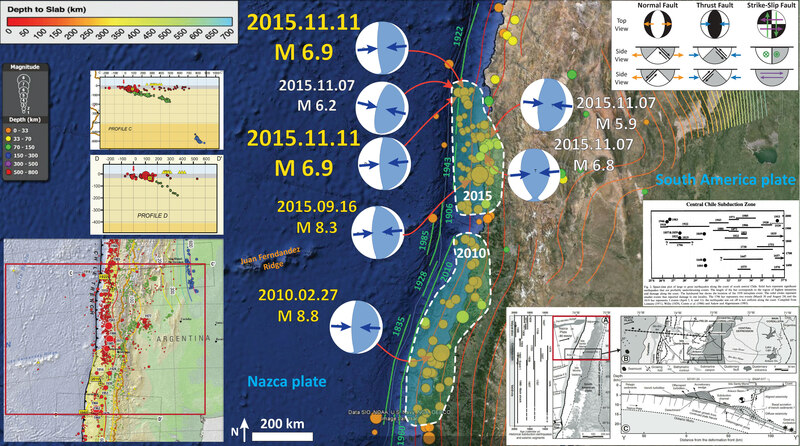 M 6.7 earthquake swarm in northern Chile! 2014/03/06: This is the swarm that started it all.